Communication designers and educators have a unique role to play in the creation of sustainable futures, due to our ability to help people develop new cognitive skills for dealing with complexity and to create the social capacity to act on the basis of new knowledge. Transformative learning is a pedagogic practice developed in consciousness-raising and women’s education in the 1970s. As such it contributed to the massive shift in power relations for women in the twentieth century. Similar strategies can now be used to confront contemporary challenges in regard to human relations with the natural world. 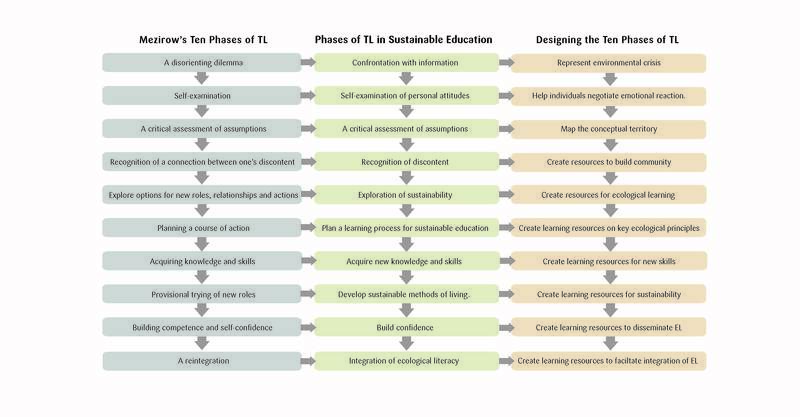 This chapter argues that transformative learning (TL) has the potential to transcend the notorious value/action gap that divides our awareness of environmental threats from our capacity to take appropriate action. Transformational learning engages an ecological view of education that is relational, holistic, participatory and practical. Although transformational learning was not developed explicitly to deal with environmental education, it provides a relevant framework to inform a learning process for ecological literacy. Transformative learning involves becoming aware of one’s assumptions to address issues from a fresh perspective. Beyond the mere dissemination of information, transformative learning challenges assumptions and facilitates dialogical learning processes. Because the problems concerned with sustainability are both very complex and deeply entrenched into our culture, these processes are useful the learning associated with ecological literacy. Unfortunately, TL remains a severe challenge due to the fact that individuals are often intensely threatened by the prospect of re-examining accepted norms of beliefs and behaviour (i.e. addressing epistemological error – see 1.5). Transformative learning theory informs the design of the communication practices and learning processes in this thesis (especially the Teach-in).